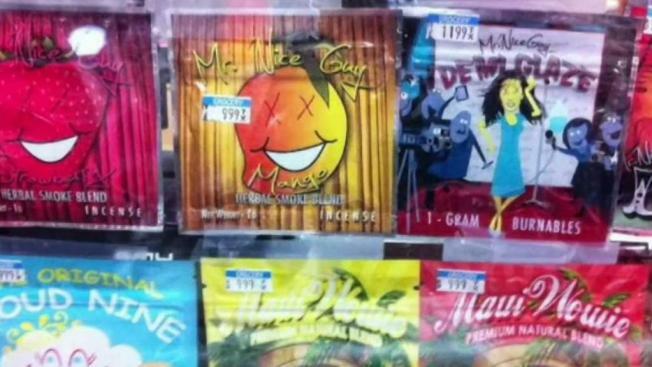 Authorities in Manchester, New Hampshire, are dealing with an increase in the use of synthetic marijuana. In the midst of the heroin epidemic in New Hampshire, the state's largest city is seeing a drug problem of a different kind. Officials say synthetic marijuana, commonly known as "spice," is causing some scary situations in Manchester's parks. Manchester Fire Chief Dan Goonan tells NBC Boston spice calls are up 100 percent from last month to this month, and they're mostly responding to the homeless population in Veteran's Memorial Park. "It is very disappointing," said Manchester mom Patricia Pauly. She won't bring her family into Veteran's Park. "He just asked me if we could go in the park, and I said, 'I'd rather not, so we will just sit out here," Pauly said as she sat with her son and two grandkids just outside the park. She says the park has been ruined by people smoking and doing drugs. "You can't use it and feel comfortable and safe," Pauly said. The city’s fire and police chiefs both agree. "Quite frankly, I think it can be dangerous at times," Goonan said. They're seeing a major uptick in calls to the park for people tripping on spice. "You'll go to a spice call where someone is completely unconscious, and you'll go to a spice call where someone is eating the local flowers," he explained. Spice is a synthetic drug that's illegal to sell and smoke in New Hampshire. But you can buy it legally in Massachusetts. "Either people are going down to Lawrence and picking it up and coming back, or people are coming up from Lawrence with boxes of it," said Manchester Police Chief Nick Willard. The problem is so bad, Willard is drafting a policy to outlaw smoking in city parks. "I think officers need to be in position to do something about it," Willard said. It's not sitting well with people who say they're respectful cigarette smokers. "Don't stop the smoking, stop the spice," said lifelong Manchester resident Richie Soucy. But those same folks admit that spice is having a scary impact on their lives, as well. "I have been frightened very much," said Soucy's friend, Maryanne Fedele. "People are getting crazy, biting trees, doing all kinds of crazy things," Soucy said. Willard says his officers are spending a lot of time in the park, promising park-goers that if they're caught smoking or selling spice, they will be arrested.